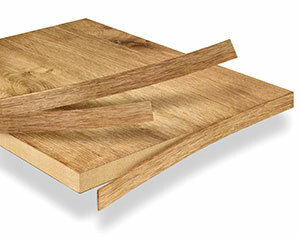 Edgings at OSTERMANN.EU: the perfect finish to every board! The Rudolf Ostermann GmbH is a growing company that aims to deliver top quality edgings for craftsmen, furniture manufacturers, carpenters, joiners and professionals whatever the project. In this respect the main priority is the satisfaction of our customers. With some 22,000 pallet bays, Ostermann offers a multitude of edgings that form the basis for all interior design works, for carpentry and joinery requirements. The company boasts Europe's largest range of edgings with over 12,000 edgings and profiles in stock. This makes Ostermann the direct point of contact for every type of edging processing. 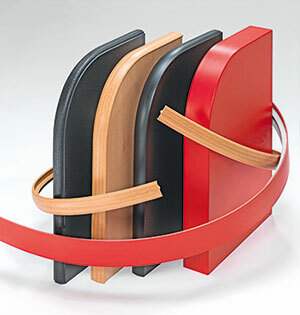 The perfect product surface and easy reworkabililty with special finishes are the features of Ostermann edgings. There is where professionals can obtain suitable edgings with finishes and structures from Europe's largest cross reference list with 120,000 listings. Ostermann also offers customers products in every length from just 1 m and every width up to 100 mm and dispatches its products in the smallest quantities. If requested, Ostermann will deliver edgings with hotmelt adhesive coatings or in laser-compatible form, all from the largest cross reference list in Europe with 120,000 listings. Customers who buy products online can take advantage of a 2% online discount and can look forward to receiving their goods within 24 hours. What's more, Ostermann is an innovator for carpentry and joinery requirements and is always on the search for novel products and solutions. ABS edgings in thicknesses of 0.4 mm to 3 mm, which feature excellent workability characteristics and material durability. Whether uni-coloured or patterned finishes - these ABS edgings are available in various design finishes as well as in high gloss, super matt and coarsely structured versions. The right panel end profile can be selected from widths between 16 and 100 mm. Customised colour and decorative finishes are available. These are products where domestic and exotic woods are shaped into edgings: thin, thick and transverse veneer edgings as well as multiplex and end grain edgings of the highest quality. Also available in laser-compatible form or with a hotmelt adhesive coating. Solid wood edgings from the range of real wood edgings lend an elegant and natural look to panels of every type. Good quality at a small price is what makes these edgings stand out. Multiplex edgings for especially creative design ideas. They are available in the wide range of thicknesses and are made from top-grade woods. The symmetry edging, for example, delivers the perfect border for every furniture piece and is available in four combinations with various stripe thicknesses. Aluminium sandwich edgings consist of inter-layered solid wood and aluminium. 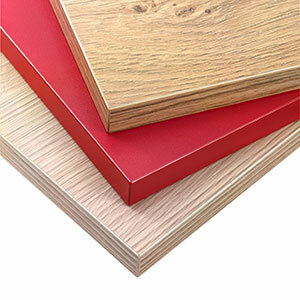 Melamine edgings are particularly suitable for less exposed points for the small area covering of timber products. They are a cost-efficient alternative to plastic edgings and are available with a hotmelt adhesive coating or in laser-compatible form. Alongside its classic edgings range, Ostermann also offers customers soft edgings. Available in a diverse range of colours, these edgings are a convincing solution with their range of practical applications and visual appearance. Particularly easy to apply. Provisional fixing of the T-bar edging with reverse-side attached bar. These T-bar edgings are made of plastic or aluminium and can be used flexibly. Selected profiles are also available in small quantity deliveries. These 3D acrylic edgings have a distinctive three-dimensional appearance, created by the decorative effect embossed in the reverse side with a 1 or 2 mm thick acrylic layer. This look is still visible in the milled area of the edging. These 3D acrylic edgings are available from just 1 m in length and in various widths. These laser-compatible edgings deliver a perfect transition to the board. Visible joints are now a thing of the past. They offer outstanding moisture resistance and are highly adhesive. These edgings deliver added value in the form of quality and appearance. Learn more about the Ostermann edgings for modern laser technology.